THE BLOG ARCOORLO GUANTANAMERO ,CUBA: OF TOMATOES AND PROLETARIAN INTERNATIONALISM. I witnessed the largest harvest of tomatoes back in the year 87 of the Caujerí Valley.Harrows and harrows lined up to transport the fruit to the whole island. Tomatoes at breakfast, tomatoes in lunch and tomatoes at dinner. The people saw tomatoes even in their worst nightmares. And Fidel Castro could not take advantage for propaganda purposes of the great harvest of Tomate del Caujerí Valley. Other more international things worried his World Maximum Authority Complex. In the country of Angola the Angolan-Cuban troops retreated before the Angolan-South African enemy. Castro put the tomato aside and took care personally-and with his military sycophants-about the matter. He sent more Cuban soldiers to fight in a foreign country to win the war at the price that was necessary. Result: the battle of Cuito Coanavales drove the enemy soldiers of UNITA back to their positions on the other side of the Angolan border. ALL TO PROTEST BY THE YATERITAS BEACH IN GUANTÁNAMO. Who has not lived in Gtmo a few years ago and has not bathed in the famous Yateritas Beach? Famous for all the Guantanamo people, although its proximity to the American naval base was not enjoyed in all its extension and not only geographic. There was a police post at the west end of the beach that prevented all non-military Cubans from passing, with arms on their shoulders and severe facial expressions. I wrote in my blog a few months ago "A Cow on a Cuban Beach" that summed up the hunger that was happening in the middle of the special period. A young cow appeared swimming near the shore and everyone-there were many people because of the suffocating heat in the provincial city-frightened her with screams so she could drown and take advantage of the beef that had disappeared from the Cuban butcher shops. Some young people even threw themselves into the sea knife in hand to see who was the first to catch the ruminant and sacrifice it right there.But the cow ran across the other shore in the border area. They say she asked for asylum in the naval base and explained with her mooch that the Cubans were murderers and wanted to flee from them. The asylum was granted - they say that now she lives in Miami in a corral with a bovine husband and everything and that her second baby waits, I say calf, and that she feels happy - part of the town remained without consuming the precious beef. Now I learn that the Yateritas beach is destroyed, by the authorities' abandonment. 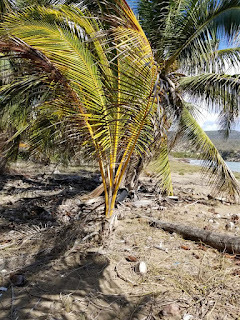 Diaz- Canel in his past tour of Baracoa, San Antonio del Sur and Guantanamo, by the route taken by the liberators mambises of the fatherland and with the false purpose of observing first hand - no hand, capable claws -, did not notice the state of the beach. Of course, it was not a tourist place nor does it have large hotels like the Meliá of Varadero and Havana. He only looked at the production of tomatoes from the nearby Caujerí Valley.Here's how things do not happen out of pure taste or are related: from a simple tomato, a population troubled by nightmares of tomatudos and the war in Angola-as STEFAN SWAIT said: small details determine radical changes in the world. I know firsthand that the doctors who were in Angola exercising their profession in peaceful villages sent them to the famous Battle of Cuito ... Those who refused said that they had come to Angola to help the poor and not to a real battle for which they were not prepared, they were returned to Cuba with "a stain on the file". Unable to aspire to higher positions in their respective specialties or not to receive the right to buy a Soviet car. Many doctors I knew condemned to the most abominable ostracism and without being able to complain. It seems to be a lie but in history there are small details that decide how to change the colonizer: from the Portuguese to the Cubans.The Angolans since that day say that they have not had another colonizing country better than Cuba: it brought equality to everyone: all were poor and miserable before the new constitution that was signed shortly after in the Republic of Angola. When the remains of the Cuban soldiers killed in Angola arrived, Fidel said: thanks to the kind harvest of tomatoes that did not distract me in my desire for conquests in other countries. He only mentioned briefly in a speech that a "Bright Future" we were waiting for on the island. The land of the Caujerí Valley was devastated for many years. It was both the Soviet fertilizer and herbicides to obtain a record harvest of tomatoes, which even the malesa did not grow for many years. And going back to the beach.As that beach is for the simple people of the fourth world it does not matter. The deterioration that is according to the photos of a girl in FB is amazing. And from there, we exhort hundreds of Guantanamo residents that we propose to complain at all levels to restore our only beach to the people. Many memories brings us this beach, our childhood, adolescence and when we were adults with children. That is what we can do for now. I do not know the Twitter of the top figures of that government who persist in failure. Our beach will be saved even for our grandchildren who will one day return to Cuba and ask how our grandparents enjoyed themselves? -In this beach, children, in this beach called Yateritas by our ancestors.